This shows the much photographed Loch-an-Eilean with its ruined castle. It is two miles south of Aviemore station. Giles was born in Glasgow and was painting the lids of wooden snuff boxes at the age of 13 and was a professional drawing master at 19. In 1823 he went to London and then to France and Italy, returning to Aberdeen in 1826. 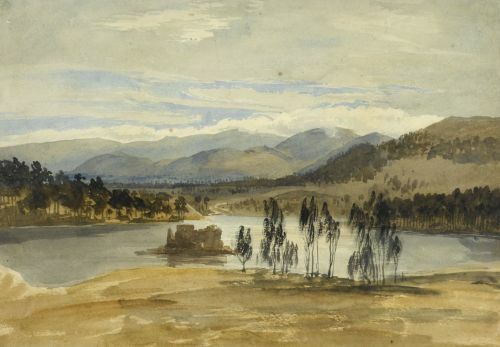 He is best known for his watercolours of Aberdeenshire castles but he was also a landscape gardener who advised Prince Albert on the gardens at Balmoral.